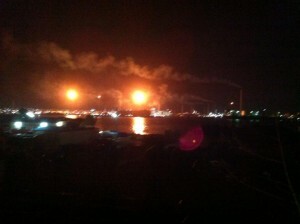 WILLEMSTAD - The flaring of the Isla refinery has to do with the strike of the workers employed through contractors. According to the Isla, due to the strike, the employees that need to perform urgent maintenance work are not there. The refinery recognizes that flaring is bad for the environment. In a press release the refinery called on contractor association AAV and the union SGTK to reach a solution as soon as possible. Yesterday was the third day of the strikes.